The nuk massage brush is a great oral motor tool for moms and therapists to use for oral stimulation, sensory issues and even for teething. The Nuk™ brush massager is used for oral massage, oral stimulation and exploration. It stimulates lateral molar ridges, reduces oral hypersensitivity, and helps develop a tongue groove. The flexible, nubby texture offers valuable sensory input for the child's mouth. Though this brush was designed initially for teething infants, it has made its way into therapeutic settings as an invaluable tool for sensory exploration. The nubby surface can hold tastes of liquid, purees or crumbs while it is used with supervision as a "spoon" for initial feedings. The NUK brush is approx. 5" long. Use only under adult supervision. The Nuk™ brush massager is used for oral massage, oral stimulation and exploratio. The flexible, nubby texture offers valuable sensory input for the child's mouth. Though this brush was designed initially for teething infants, it has made its way into therapeutic settings as an invaluable tool for sensory exploration. The nubby surface can hold tastes of liquid, purees or crumbs while it is used with supervision as a "spoon" for initial feedings. Have them available in clinics, classrooms and for families to take home! One per child, All kids Love the Nuk brush. "Our two-year-old has sensory processing issues and needs to have safe "chewies." The nuk brush is one of his favorites. We also feel that it has helped to get him more used to tooth brushing." "My son has oral sensitivity. This brush is a great product. We have been told that it helps in reducing texture issues and it seem to be helping. Great product! I wish they have more options like these for the kids to over come oral aversion!" "This product is great for kiddos who need help developing their senses in their mouth. My boy has oral motor (tongue) issues and may not be able to feel things inside his mouth like the typical 3 year old. I use it after brushing every night to help improve his oral motor and sense. 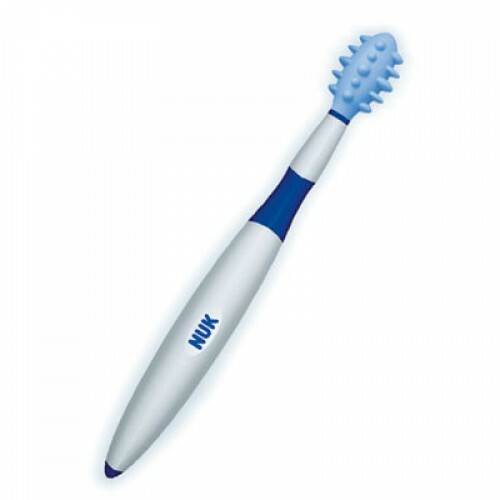 My kid has no problem brushing, so it's easy to use this Nuk brush with him." "This is great for oral sensory stimulation for my sensory kiddo." Q. What is the manufacturer age recommended for the Nuk brush? A. 6 months+ with adult supervision of course. Q. Is this product designed only for kids with sensory issues? A. No, this item has multiple uses, from Oral stimulation and teething to tactile awareness . Q. Is the Nuk brush made of safe materials? A. Latex free, the head is made out of craton and the handle, polypropylene. Q. is the Nuk brush dishwasher safe?